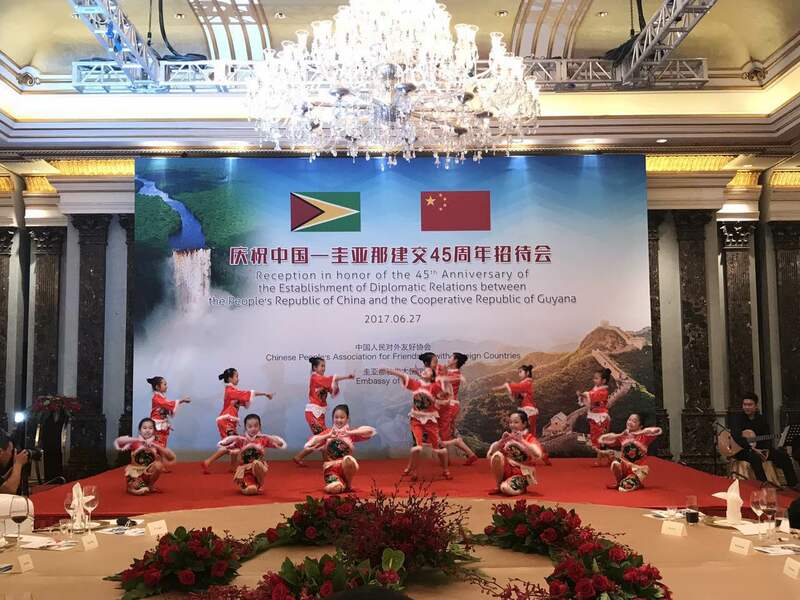 A reception in honor of the 45th Anniversary of the Establishment of Diplomatic Relations between the People's Republic of China and the Cooperative Republic of Guyana was held in Beijing on June 27. H.E. Mr. Bayney Karran, Ambassador of Guyana, Mr. Ma Peihua, Vice Chairman of the National Committee of the Chinese People's Political Consultative Conference and others were in attendance. 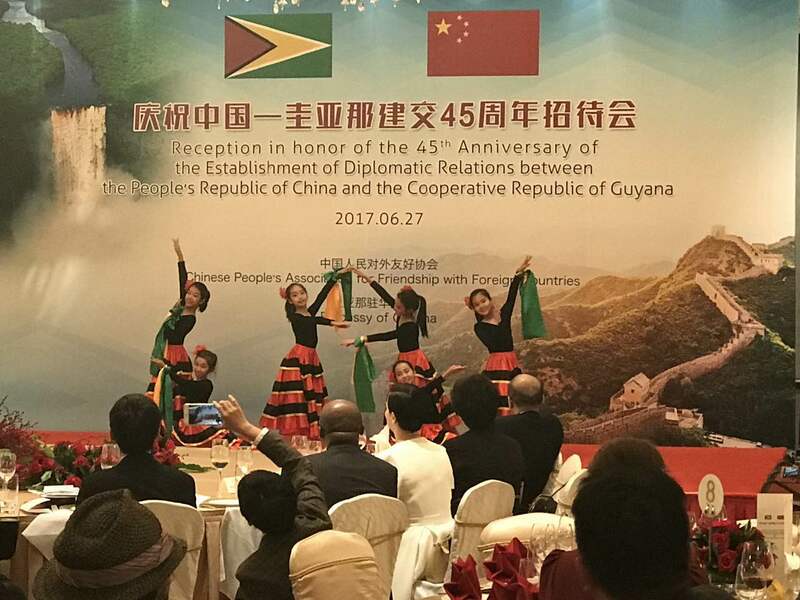 Guyana is the first country in the English speaking Caribbean to have opened diplomatic relations with the People's Republic of China on June 27, 1972, an act which was soon followed by the opening of Guyana embassy in Beijing on October 1973. 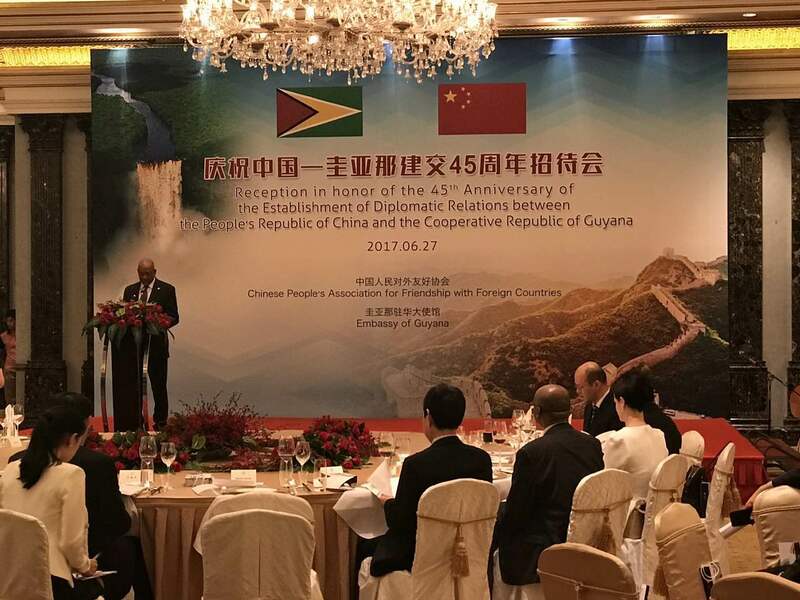 China and Guyana have supported each other's positions on key international issues such as south-south cooperation, regional integration, and China-Caribbean cooperation. According to H.E. 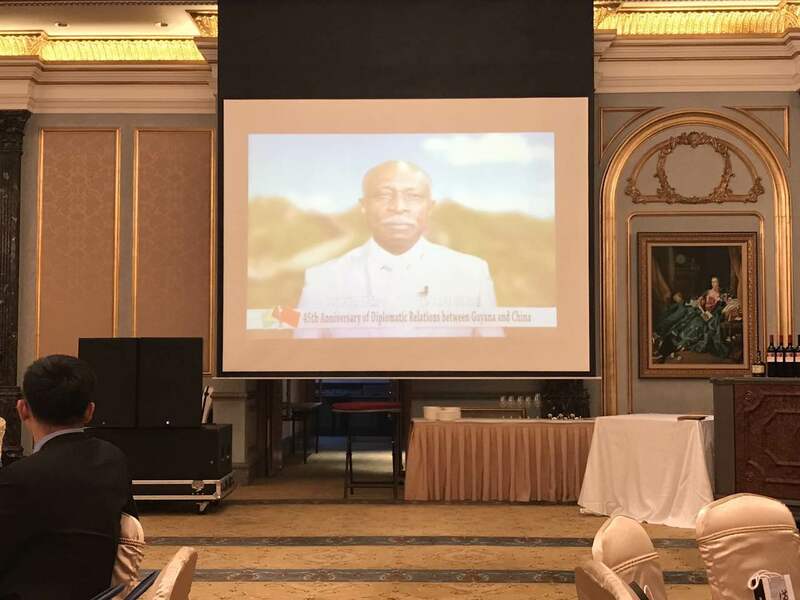 Mr. Bayney Karran, Guyana has derived tangible benefits from China's friendship and solidarity in such areas as health, infrastructure and information technology. 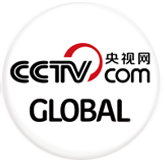 Some of China's leading companies are active in Guyana. 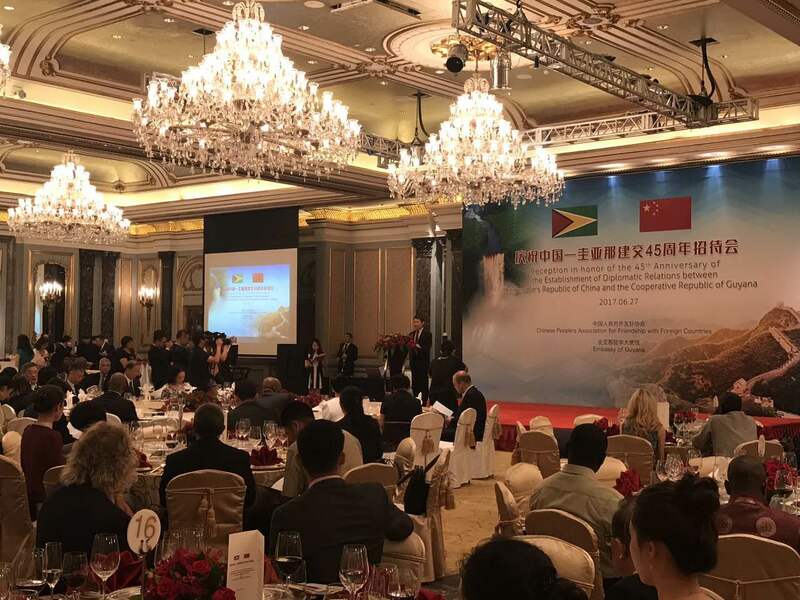 Recent initiatives included the Smart Guyana Project by Huawei Technologies, the expansion of the national airport by the China Harbour and Engineering Company and a major road expansion project by China Railway. Guyana enjoys significant Chinese investment in major industries including the forestry and mining sectors, construction, restaurants, hardware and clothing. A recently discovered offshore oil bonanza vastly expands the possibilities for economic growth and development of bilateral cooperation with China. Bilateral trade volume has risen 200 fold from US$ 1 million to US$0.2 billion in the past 45 years. Guyana is located on the northeast coast of South America. North of Guyana is the Atlantic Ocean and to the south is Brazil. Over 70 percent of Guyana is made up of forests and savannas. The country is situated within the northern edge of the Amazon rain forest, is often referred to as the lungs of the world. 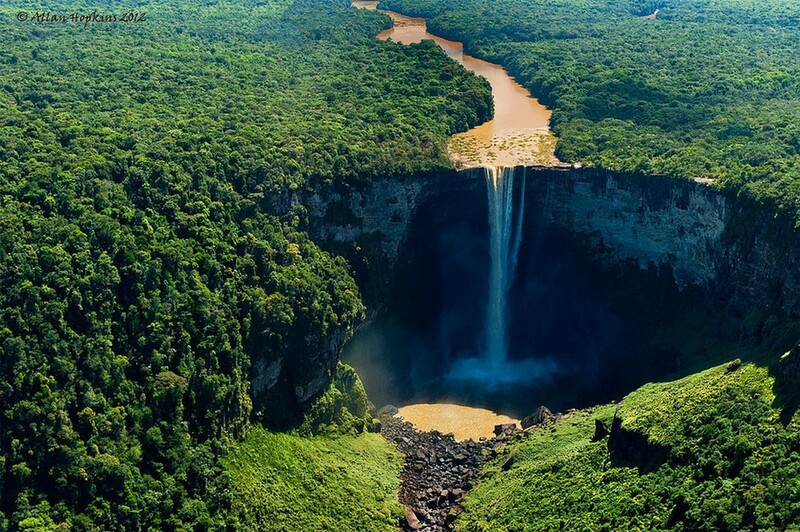 Guyana has over 50 rivers and 80 waterfalls. It's richly endowed with the bounties of nature and with rich potential from its natural resources of forestry, minerals, agriculture and energy. In 1970 when Guyana declared itself a Republic, a citizen of Chinese origin, Mr. Arthur Chung, was nominated President, becoming the first ethnic Chinese person to be head of state of a non-Asian country. Agriculture and mining are Guyana's main economic activities. Rice, sugar, gold and bauxite make up 75 percent of the country's exports. Guyana is famous for producing fine rums, gold jewelry and hardwoods. 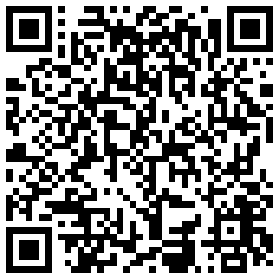 Other products include diamonds, fruits, vegetables and seafood. Tourism is increasing in popularity as more people visit to enjoy Guyana's natural beauty including its waterfalls, beautiful scenery, as well as exotic birds, mammals and reptiles in the rain forest habitat.